The forced transfer of many Cambodian citizens was often supervised by young adults and teenagers. Source: The Documentation Center of Cambodia (DC-Cam)/Rithy Panh. A fleeting glimpse from a train in Pursat province. Like cattle, heavily-laden with bags and blurred by the fleeting snapshot of a camera, the unknown pedestrians signify the ghostly character of Cambodia under the Khmer Rouge. While many people were forced to travel to rural areas by train, many were also forced to walk. 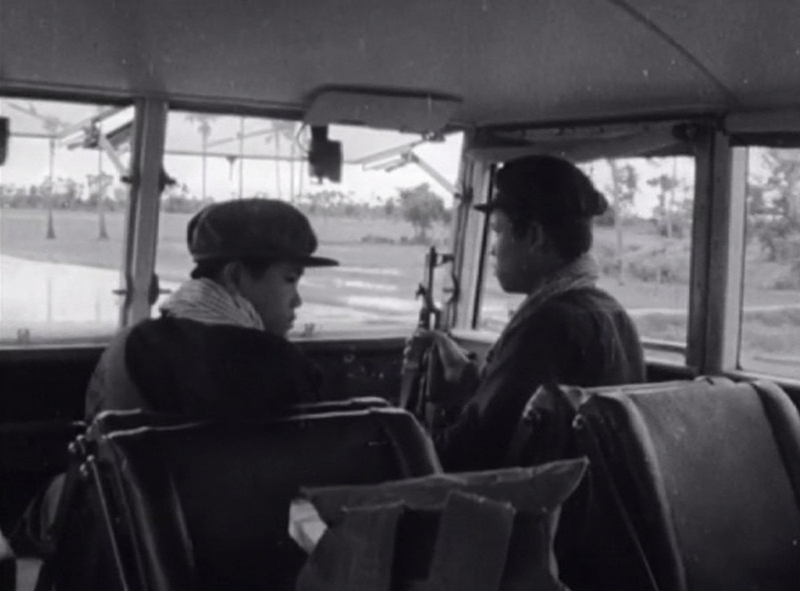 With nothing but the possessions that they could carry, Cambodians were forcibly transferred throughout the country. One may assume that those who traveled by train were the fortunate ones. But this was not necessarily the case. As Youk Chhang relates, "My family was on this train to Battambang province and we were separated from each other some time after the train arrived in Pursat province. When we were separated, I was still with my sister (Tithsorye), who much later died a brutal death in Laech village." Young Khmer Rouge train driver. Source: The Documentation Center of Cambodia (DC-Cam)/Rithy Panh.